The Polish Weekly recently interviewed Republican Congressional candidate Andrew “Rocky” Raczkowski; and, in so doing, it gained exclusive access to his efforts along the campaign trail. In 2010, he hopes to win the Republican nomination to unseat current United States Representative Gary Peters of the 9th Congressional District – whom The Polish Weekly interviewed one month ago. If he wins the August 2010 Republican Primary, he’ll challenge Gary Peters in the November 2010 General Election. Rocky Raczkowski boasts an impressive set of experiences and skills. He grew up in Farmington Hills, MI, to a Polish immigrant family. In college, he earned a Bachelor of Arts degree in political science and psychology; and, he began Master’s studies soon thereafter. He earned a law degree while serving in the State Legislature; and, he fluently speaks three languages. 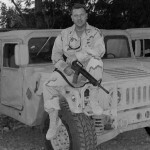 He enlisted with the Army at the age of seventeen; and, in 1990, he completed Officer Candidate School. He is currently a Major within the U.S. Army Reserves; and, he has served multiple tours in Afghanistan and Somalia to support the Global War on Terrorism. For his efforts, he earned the Bronze Star for meritorious service in combat. He returned from his latest tour in September 2009; and soon thereafter, he announced his candidacy for United States Representative. In 1996, he was elected to the Michigan House of Representatives; and, upon his re-election in 1998, Rocky became the youngest Majority Leader in the country. In 2002, he campaigned but lost against Carl Levin for a seat in the United States Senate. On top of politics and military service, Rocky is a successful businessman. He is the Chairman and CEO of Star Tickets – a competitor to firms like Ticketmaster – and has served within the Greater Farmington Chamber of Commerce, among other organizations. I first met Rocky on Friday, December 11, 2009, at 6:00 PM at an event that he sponsored at the Forest Lake Country Club in Bloomfield Hills, MI. He greeted me with wonderful news – just two hours earlier, he became engaged to his girlfriend Amalia Kaddo. Amalia is an incredibly intelligent and hard-working woman of Lebanese descent; and, she maintains deeply rooted values that are built upon her Catholic faith. I observed Rocky at the Country Club as he greeted and spoke with attendees. He spoke with warmth and candor; and, attendees seemed to appreciate his accessibility and openness on a wide range of issues. For instance, a concerned woman asked Rocky of his recent tour of duty in the Horn of Africa. His response? “It sucked – and, you can quote me on that.” Another attendee described her upbringing in Petoskey, MI. He knew the region so deeply that he described not just the issues and history of the city, but the stories of local residents he remembered during previous campaigns. Many congratulated him on his engagement and candidacy; and, Rocky offered genuine gratitude for their kind wishes. He spoke briefly to the attentive audience; and, the event organizer couldn’t help herself from announcing Rocky’s engagement and introducing his new fiancé. Both he and Amalia laughed – and, he blushed from all of the attention. Afterwards, we traveled to a private residence in Troy, MI, to attend a Christmas Party for the 9th District’s Republicans. Of the four Republican candidates for United States Representative, three arrived – and, the remaining candidate’s campaign advisor came to represent him. The approximately two-hundred guests were a who’s-who of local Republican leaders; and, they came to hear the candidates’ views in a forum atmosphere. So, at approximately 8:00 PM, the party’s hosts initiated a mini-debate amongst the Congressional candidates. Attendees were allowed to ask any question – and, the candidates were given one minute to respond. Rocky offered a heartfelt opening statement during which he described his experience as a Casualty Notification Officer. He was ordered to knock on a family’s door – a constituent that he knew very well – to inform them of their son’s death in combat. It was the hardest thing he’d ever done, he said; and, he explained that he’s running for the House of Representatives so their sacrifice would not be in vain. Attendees asked various questions, including those regarding international policy, taxation, and personal rights; but, the question about the Afghanistan War was by far the most gripping. Rocky’s views on the issue are fundamentally based upon his experiences in combat; and, he passionately believes that Soldiers should only be sent to war to combat enemy forces – and, not to nation-build. Afterwards, Rocky granted The Polish Weekly an exclusive thirty-minute interview. Rocky is a considerate individual; and, he generously allowed The Polish Weekly to shadow him and speak with his constituents during these campaign events. He is a first-generation Polish American who has committed himself to improving the lives of others through the values he learned within our community. His efforts to engage American life and society represent an important opportunity for Polish Americans to obtain respect and influence in Government. The Polish Weekly sincerely thanks Rocky Raczkowski and Amalia Kaddo for their generosity; and, it looks forward to reporting on his efforts during the campaign. Thomas Mikulski: You were raised within a Polish American household in Farmington Hills, MI. Tell me about that upbringing; and specifically, describe the contributions from the Polish American community to your development as an individual. Rocky Raczkowski: The Polish American community in Michigan is politically active; and, it is very active in the community. Polish Americans take great pride in their families and their development; and, they always strive to make their communities a better place to live. I grew up with wonderful friends who worked at Chrysler, Ford, and General Motors and helped to build the community in a way that made Michigan great. As you surely know, the largest ethnic group in Michigan is Polish; and, its organizations and Churches contributed greatly to the development of my character. My parents were active in the community – my father was particularly active at the American Polish Cultural Center, and my mother was active with the Polish Youth Association and other organizations. And, they were both very active with the Polish American Congress and the Polish National Alliance. And so, my Polish roots are a very important part of who I am. In particular, the Polish American community’s extraordinary work ethic taught me to achieve great things and to make this country a better place to live. It’s something to fight for – and, it won’t be given to you for free. That’s what the Polish American community stands for; and, that’s what it taught me. To me, compassion for others is a very Polish trait; and, a strong work ethic – and, a deep sense of gratitude for the important things in life – it’s all very Polish. And, it’s an ethos that is prevalent among many first-generation Americans of various ethnic groups. TM: You volunteered for your first political campaign at age eleven; and, in 1998 – as a Representative in Lansing – you became the youngest Majority Leader in the country. What initially led you into politics? And, what personal characteristics have most contributed to your success? RR: I first became interested in politics by watching my parents’ – and, the Polish American community’s – active involvement in achieving great representation in Washington, D.C., and Lansing. It taught me so much about being accountable to your community. And, the ingredients that made me successful are being accessible, accountable, and straightforward. These are the three main characteristics that people want from their elected officials. And, I’ve always lived up to these ideals because it’s what I’ve been taught. As a result, I’ve been very blessed. TM: You’ve been away from politics for seven years. Why have you decided to run for Congress now? And, how would you be different from current United States Representative Gary Peters? RR: First, I just returned from overseas service. I’ve served in the military, I’ve been elected before, and I’m a fearless leader. And frankly, I’m extremely frustrated with the direction upon which our Nation is headed. We’ve taken on incredible debt; and, we’re destroying both our manufacturing base and our country. Let’s face it – this Administration and the previous Administration railroaded the foundations of our Middle Class and its ability to build wealth. And, I’m just as frustrated politically with Republicans as with Democrats. And, this frustration has led me to believe that we need better servants in Congress. I’m frustrated with the lack of leadership and service to others in Congress; and these days, politicians think that they’re royalty. In my view, that sense of royalty ended during the Revolutionary War. We as Polish Americans have always had a tendency to confront those who don’t serve others; and, those who don’t serve liberty or freedom. The current Congressman has unfortunately voted against the Middle Class; and, he’s voted against his own District by supporting Cap and Trade legislation – which will cost Michigan’s Middle Class families an average of $1,700 beginning next year. And, many of your readers cannot afford any additional costs on their budget. When Government takes your disposable income, it denies you the right to do what you want with what you earn. TM: You volunteered for the U.S. Army at seventeen years old. Are you satisfied with your experience? And, what has it taught you about the United States’ role in the world? RR: I wouldn’t use the word, “satisfied”; instead, I’m incredibly honored to serve in the United States military. As a young Soldier, I enlisted in the Infantry; and, four years later, I became a commissioned Officer. I have become concerned with the manner in which our leaders utilize the military; specifically, that the military is being used for nation-building instead of to destroy enemies. And so, I’m incredibly honored to have served my country – I’ve now served for about twenty-four years – but, I don’t believe that nation-building works; and, I certainly don’t believe it works when you use the military to do it. TM: As a Soldier, you served in Afghanistan and in Africa to preserve American security interests abroad. As not just an American citizen but a recent veteran, you have a vested interest in our efforts there. Do you agree with the President’s decision to surge American forces into Afghanistan? RR: I do – but, only if they’re used to crush the enemy. If they’re not, I think it’s a waste of time, money, and lives; and, under those circumstances, they should be brought home immediately. You either fight the war to win or you don’t fight it at all. You don’t send Soldiers to war to become police officers – you send them to war to win the war. If victory is not the main reason you send Soldiers away from their families, then you shouldn’t send them away in the first place. TM: As a United States Representative, you will be asked to influence American policies abroad. In your view, what are the most pressing international challenges for the United States? And, how should the United States resolve them? RR: In my view, the most important international challenges are the devaluation of the American Dollar and the economic policies of the United States Government. I would implement fiscally conservative measures to manage the Treasury; and, I would fight to bring the budget under control. I don’t believe in sending tremendous amounts of aid to foreign countries – instead, I think it should be sprinkled only to key strategic regions. Otherwise, we shouldn’t be sending our money. We should support our allies, such as Poland; and, we should support Israel. Most importantly, we should rebuild our international prominence by building value into the dollar. And, you do so by applying fiscally conservative policies into the manner in which you control spending. You cannot spend more than you bring into the budget; and, you need to eliminate certain entitlements. You need to end wasteful spending; and, you need to truly stop earmarks from entering into the Federal budget. TM: How do you view the United States’ relationship with China? In particular, does the Federal deficit negatively influence our strategic relationship with China; if so, how should the United States respond? RR: Our deficit absolutely weakens our position with China. Right now, you see our President bow down to China – like he has with every other world leader – because it owns around 20% of our national debt. And, it continues to grow. Furthermore, you certainly need to develop a global economy; but, a global economy must also be fair to all participants. Our current trade deficit is overwhelmingly high; and, on top of that, we’re not allowed to trade fairly. I obviously believe in free markets; but, free markets must also be fair markets. If you tax our goods in China, then your goods in the United States should be taxed as well. TM: The Polish and Polish American communities have long objected to the visa restrictions imposed by the United States on Polish citizens. In light of their contributions in Iraq and Afghanistan – and, of their steadfast support for the United States – is it time to drop the visa requirements for Polish citizens who wish to enter the United States? RR: Yes – I think it’s time to drop these requirements. And, it’s not just because I’m of Polish extraction; but, because Poland is a strong ally and major trading partner. Americans and Poles are both educated; and, they bring assistance to one another. However, we should limit immigration from refugee states – such as Somalia and others – who’s citizens do not speak English and cannot perform meaningful work in the United States. Immigration from these states should be limited. Poles speak English; and, they’re highly educated. And, they’re part of a workforce that would benefit the United States. So, on those grounds, I’d support efforts to drop visa restrictions for Poles. TM: The President recently decided to abandon the European Missile Defense Shield as envisioned by President George W. Bush. Do you agree with his decision to do so? RR: Absolutely not. It’s one of the worst decisions he could have made. And, he only did so to become a closer ally with Russia. In my view, it was one of the President’s worst mistakes. TM: What do you think of the President’s efforts to reform the United States’ health care system? Are there any aspects of the proposed legislation that you support? RR: None. I don’t agree with his efforts at all. If you want to extend health care coverage to the poorest Americans, you expand Medicaid and turn it into something that doctor’s want to accept from patients. But, the President’s efforts interfere with people’s decisions and lives; and, they ration care. I truly think that it’s one of the worst things that could have happened to health care in the United States. We in the Polish American community have always been against Government control; and, we’ve always resisted its efforts to tell us what to do. TM: The State of Michigan has been particularly battered by current economic conditions. As a United States Representative, how would you tackle the ongoing recession? Has the Government’s response to the recession been satisfactory? RR: The Government has not been responsive at all. It’s mismanaged the economy by overspending – which will lead to higher inflation – and, the Carter Administration taught us that these practices lead to longer recessions rather than shorter ones. To overcome this crisis, you first need to limit Government spending; and second, you need to lower taxes on families and eliminate the regulatory burden that you have on many businesses. You also need to implement fair trade policies so families have a chance to rebuild the Middle Class. And, you need to implement policies to spur job creation. TM: For decades, Detroit’s economy has been almost exclusively focused on the automobile industry. In light of the economic difficulties that this region has faced in recent years, is it time to diversify Detroit’s industries away from purely automobiles? If so, which industries should our region focus on? RR: Well, we should have diversified our industries twenty years ago. But, it’s never too late to diversify; and, there are several industries in which I think our region would excel. We should expand venture capital, which spurs creation and innovation; and, I’d gladly push an effort – which I first attempted ten years ago in the State House of Representatives – to bring financial markets to Detroit. TM: Besides health care and economic reform, what is the most pressing long-term domestic issue for the United States? As a United States Representative, how would you resolve it? RR: For me, the most important domestic issue in the United States is job creation. And, I’d resolve our inability to create jobs by creating a fair trade equilibrium between our trading partners and the United States. This would ensure that our products are not highly taxed in other nations; or, that Government interventions within our trading partners do not interfere with efforts to bring our products in for sale in their own countries. Second, you need to address taxes and Government control such that they do not overburden individuals and job creation. TM: The United States’ educational system has long been criticized for its performance relative to those in other countries. As a Representative, how would you improve education in the United States? RR: First, education under the United States Constitution is a State’s issue. So, education in the United States should be determined by the State Board of Education. To improve educational quality, I would eliminate funds at the Federal level that we keep in the Department of Education and return it to the States. Of course, we should pay teachers more; and, we should reduce our class sizes. And, we should implement additional accountability measures. Again, I view education as a State’s issue; so, as a United States Representative, I would eliminate the Department of Education because that money must be sent to the States to reduce class sizes and implement accountability measures. In other words, it should be a State’s issue and not a Federal issue. TM: How closely do you work alongside Democratic opposition; and, how closely does it work with you? Have you taken any steps throughout your political career to soften the political polarization that seems to afflict our civil discourse? RR: Absolutely. I have a record of reconciliation between Republicans and Democrats. I don’t have to agree with my opponents; but, I can understand their viewpoints and reconcile. You can be civil but still disagree; and, under those circumstances, you can still bring issues before the people because – in the end – they will decide who represents them. In those terms, I have never had problems with Democrats or Republicans. In fact, I’m running for Congress now because I’m frustrated with both political parties; and, I think we have the wrong people in political office to solve the problems that face us. But, I’ve not been an enemy to one party or another. I’ve simply voiced my opinion – and, that’s the opinion of the majority of people. TM: You are a proud descendant of Poles – and yet, you’ve found incredible success in politics, business, armed service, and education in the United States. Have you ever found conflict between your desire to succeed in the United States and your identity as a Polish individual? RR: Certainly. I’ve had instances where someone discriminated against me. In the past, we’ve all heard people call us “dumb Polaks”, among other things. But, one of our community’s greatest strengths is its work ethic; and, we never take “no” for an answer. We work hard and stay focused on our ideals. And, no one can ever take that away from us. It’s something that I learned from my parents; and, I think it’s taught to most Poles. I am proud to be an American of Polish descent – I was born here – and, it doesn’t matter what others think as long as I do the right thing and serve others with a pure heart. TM: How would you characterize the Polish American community and its role in American life? How can it expand its influence in the United States? RR: That’s a difficult question. I mean, our Polonia is very active; but, it’s not very well organized. And, we need to organize ourselves and help each other instead of worrying about which member has more or less than others. We should support each other; and, we should help one another grow and build the community. In this regard, I like the methods employed within the Chamber of Commerce. That is, we support each others’ businesses; and, we support one another’s goals and dreams under the American system to further develop America. With that as a main goal, we can then help build our own families; and, we can then build our own communities and expand our influence within it.